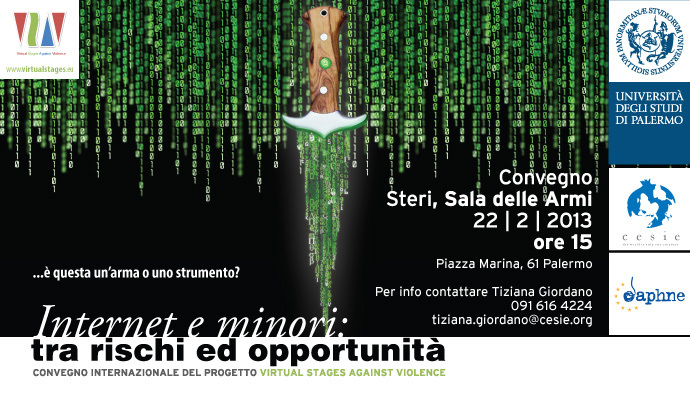 CESIE – European Centre of Studies and Initiatives – and the Department of Political, Legal and Social Studies of the University of Palermo present the International Conference “Internet and Young People: Risks and Opportunities” closing the project Virtual Stages Against Violence. The afternoon will be dedicated to addressing the issue of the relationship between young people and new media, proposing solutions for teachers and educators to use in their work. The keynote speaker will be Mario Morcellini (Director of the Department of Communication and Social Research, Sapienza University of Rome), accompanied by the coordinators of the Virtual Stages initiative in four European countries – CESIE (Italy), die Berater (Austria), Salvati Copiii (Romania), Thüringer Volkshochschulen (Germany) and University of Palermo (Italy). Virtual Stages Against Violence, funded by the European Commission in the framework of the DAPHNE III Programme, is an innovative project that has explored the risks and opportunities that young people encounter when using new media. The active involvement of young people, parents and teachers has resulted in the development of a unique solutions including a toolkit and online game. All participants to the Conference will receive a certificate of attendance released by MED (Italian Association for Media Education), a training body accredited by the Department of Education, University and Research (MD 23/09/2003), certifying the acquired competencies.